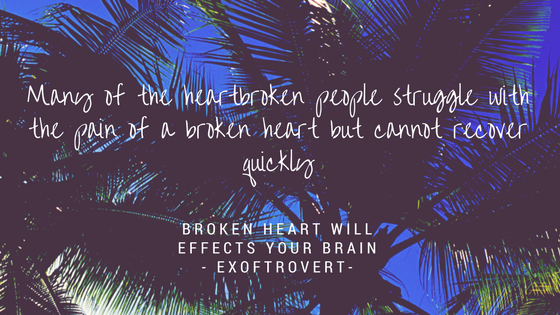 Broken Heart Will Effects Your Brain - Maybe some of us are able to hide the sadness that is felt after the breakup. But, there are some people who, like melancholy, will continue to feel sad and hurt or even feel bad because of a breakup. There are some people who even lose their appetite, cannot sleep prolonged, or choose to do useless things and hurt themselves because of their heart is broken. But did you know that in addition to hurt, a separation from a breakup can lead to more dangerous illness? Yes, a broken heart can cause adverse effects on our brain. As the ongoing symptoms of a broken heart occur, our brain responds to this with many things, the following quoted from Psycologytoday are the three great things that happen to our brains when we feel a broken heart. Based on fMRI studies, heartbreaking pain can also activate mechanisms in the brain similar to an active mechanism when one is feeling addicted to cocaine. Symptoms of a loss of love affect the brain to think, focus, and function better. Of course, we do not expect that to happen because we both know that there is a mechanism in the brain in an abnormal mental state. We just have to look at a broken heart in the same way and that we can change the motivation to become a better human being. Activities related to heartbreak have a mechanism that can activate parts of the brain that will be active when we experience physical pain. In some studies, the resulting emotional pain is judged to be close to the pain of physical injury. When we feel a broken heart, then the brain will cause a lot of thoughts that will interfere with what we have gone through with former lovers. Small talk of conversation, some memories, or just a smile about an ex will appear sudden and disturbing. It might be that we'll again feel sad, or we'll feel the same pain because of a broken heart and trigger us to be aloof and unproductive. Given that these belly-up thoughts can happen at any time, even dozens of times in certain times, it proves that many of the heartbroken people struggle with the pain of a broken heart but cannot recover quickly. To know that the challenge of recovering from painful feelings of broken hearts, we must begin to be more selfish to force ourselves to forget them. At least, not to blame yourself for the failure of the relationship. And to know that our brains can relive an ex at any time without interruption, helps us to choose to stop thinking about it and going on.